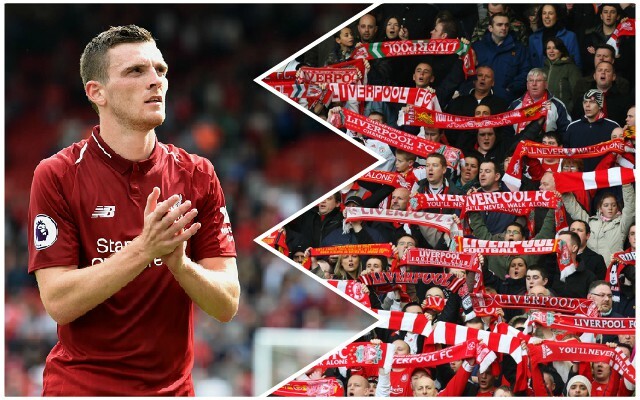 Andy Robertson was quick to hail the Anfield crowd following Liverpool’s 3-0 victory against Bournemouth on Saturday afternoon, with fans far more supportive inside the stadium than last time out. Against Leicester City, there were nerves from the stands which transcended onto the pitch; when Eddie Howe’s Bournemouth came to Anfield, however, lessons had been learned. That simply has to continue until May. Robertson told LiverpoolFC.com post-match: “It was brilliant. The fans got behind us, they were in nice and early and they got behind us from the first whistle. It always makes a difference. It’s clear that the twelfth man really does make a difference – and it has to stay that way in the final 12 games. Watford, Burnley, Tottenham, Chelsea, Huddersfield Town and Wolves are still to come to Anfield in the Premier League, and getting as many points on the board as possible from those matches will be crucial. It’s up to us as fans to keep our heads as well as the players. Anyone heading to Anfield between now and the end of the season has to be on the top of their game – just like the players will have to be if the Reds are to get over the line.